At some stage they will be unable to keep working, and if the person with dementia was the main earner this may cause financial hardship. Families may have to deal with this as well as sorting out superannuation, medical and income insurance. Sometimes partners may have to reduce hours, or give up work to continue caring for the person with dementia. Remember, dementia affects people differently. One person may begin to lose the ability to handle money, pay bills or make competent business decisions at an early stage; another may retain these skills much longer. Sooner or later abilities will decline and the person with dementia will require assistance making decisions about financial and legal matters. However, it is important to assist a person with dementia to act as independently as they are able, making use of the skills they have retained. Planning ahead makes it easier for carers to manage the affairs of the person with dementia. While the person with dementia can still take part in the decision making process and is legally competent to sign any documents it is important to make decisions, such as where the person with dementia will live. If a bank account is in joint names, the partner of the person with dementia can continue to operate it without any change in arrangements. However problems can occur if the person with dementia uses the account inappropriately or has accounts in their name only. To avoid these difficulties the person with dementia can give authority, while legally competent, to another person to operate the account. It is important to remember that this authority will become invalid if the person is no longer legally competent. If the person with dementia is unwilling to agree to a change of arrangement it may be helpful to consult the bank manager about a possible solution. Limits can sometimes be put on bank accounts to ensure that there are limitations on how much can be spent on a daily basis. A will gives instructions as to how the estate of a deceased person should be distributed. A will is only legal if the person understands what it is they are writing and signing at the time it is completed. It is essential that if the person with dementia wishes to make or update their will, they do so while they are still legally competent, as advised by a doctor (a medical certificate, as close as possible to the time of the Will’s completion is good evidence of this). In most states and territories you can sign a document called an Enduring Power of Attorney if you are legally competent at the time of signing. This will continue to have power once you have lost competency and can no longer sign for yourself. An Enduring Power of Attorney is a legal arrangement that varies enormously between states and territories as to what it covers, so it is important to seek legal advice before completion, or when moving interstate. A financial Enduring Power of Attorney enables a nominated person to look after your financial affairs if you become unable to do so yourself A medical Enduring Power of Attorney covers only medical decisions. Because an Enduring Power of Attorney can only be completed while a person is legally competent, many people have Enduring Power of Attorney regardless of any illness or diagnosis. This may be especially important if you have joint ownership of a home or property. A general Power of Attorney is also available but is only valid while you are legally competent, and is of no use when you are no longer able to make your own decisions. One of the benefits of having an Enduring Power of Attorney is that it allows a person with dementia to choose someone to act on their behalf in legal and financial matters when they are no longer able to do so themselves. The person chosen must be responsible and trustworthy. Ensuring that you have selected the correct person(s) to manage your affairs, that they are willing and able to manage them in your best interest. If you lose the legal capacity to make decisions about your medical treatment, someone else needs to make those decisions for you. This varies between states and territories, in some you can appoint someone you trust to make these decisions. If you have not planned ahead the law in every state and territory allows a particular court to appoint someone to make decisions for you. An advance directive, which is a written document expressing your wishes about medical treatment. Advanced directives are a relatively new concept in some states/territories and are still being mapped out. Ensure that if you have made decisions about the end of your life, such as resuscitation and life support decisions, that you have discussed this with your GP and that there is a record of the discussion and decisions made in your file at your hospital and with your GP. It is also useful to have a copy of this handy should you be rushed to the hospital in an emergency. Medical Guardianship also exists in some states and allows for a person to choose a substitute decision maker. Different names may be used in some states and territories, but the function of the document is much the same. There is a Guardianship Board or Tribunal in most states and territories that can appoint a guardian or administrator for a person who is no longer able to make decisions for themselves. If there are problems dealing with the affairs of the person with dementia, or there is conflict about the person’s best interests, an application for the appointment of a guardian or administrator may need to be considered. Guardianship may be worth considering where there is family or carer disputes. It is important to seek legal advice when considering an Enduring Power of Attorney or Guardianship application. Dementia Australia can also be contacted to discuss whether an application to appoint a guardian or administrator may be needed, and how to go about it. Dementia Australia offers support, information and referral services and counselling. 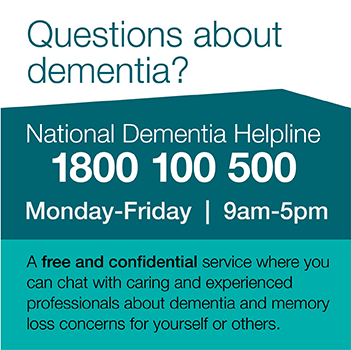 The National Dementia Helpline on 1800 100 500 can be contacted from anywhere in Australia. Dementia Australia can also put carers in touch with other carers of people with younger onset dementia or provide links to carer support groups. More information about our support services can be found in Services and programs. Find out about our Younger Onset Dementia Key Worker Program. Our Help sheets can provide you with a range of valuable information. See our section on Legal planning and dementia for more information on avoiding legal problems in the future.